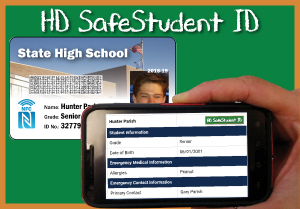 As students enter and exit a vehicle, their HD SafeStudent IDTM card can be scanned to easily verify the student’s daily attendance. This can aid in the prevention of leaving a child in the vehicle or allowing them to vacate at the wrong location. By incorporating an NFC Tag and HD Barcode with the student ID card, the student’s personal information remains secure by allowing only authorized personnel and first responders to decode this data. Should there be an emergency, the student’s encrypted medical and emergency contact information can be accessed instantly by approved reader devices. How does HD SafeStudent IDTM work? HD SafeStudent IDTM utilizes our patented HD Barcode which is able to embed an immense amount of data within a unique symbology that is not available on the open market. 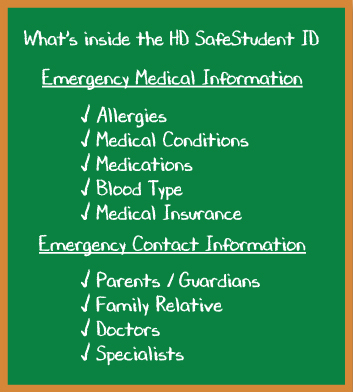 HD SafeStudent IDTM contains comprehensive medical data of students and their emergency contact information. This can be accessible by approved reader devices during an emergency without relying on internet or cellular connectivity. The benefits of utilizing HD SafeStudent IDTM are schools will utilize a user friendly data-entry program that is equipped with a back-end encryption algorithm that contains a unique authorization key assigned to each school. 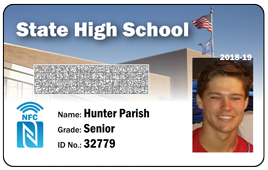 This allows the school to create their own internally used HD SafeStudent IDTM cards, configure the HD Barcode structure, and assign security settings. This ensures the embedded content can only be decoded and read via smartphones with the corresponding public key. By purging all data that is typed into the data-entry program after printing the HD SafeStudent IDTM, this mitigates any risk of backdoor access to sensitive student information. There is no possibility of an unauthorized breach of data or “hacking” from occurring. Unlike a photograph, which can be copied and manipulated to falsify ones identity, the HD Barcode cannot be reverse engineered or altered and therefore, allows first responders to positively identify a student by simply scanning their unique HD SafeStudent IDTM card. The first responder can also scan the students emergency contact or medical information to quickly notify and release a student to a parent or guardian and clearing them of involvement in an illegal act. Enhance your student safety measures further by incorporating the student’s biometric data into the HD SafeStudent IDTM card. HD SafeStudent IDTM can perform an instant match verification of the student’s iris or fingerprint to the digital template encoded and encrypted in the 2D code, all without the need of a database.